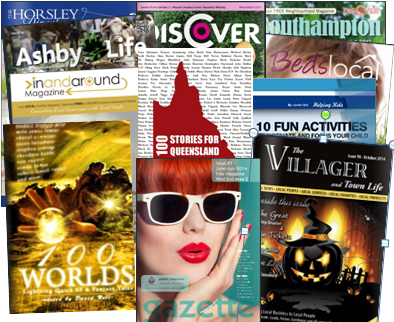 Some of us can rattle on for hours about what inspires us, whether it be the source for our religion, our art, or our parenting style we’re describing – there are plenty of things, it seems, that people might need, or find, inspiration for. But for some writers – and artists and musicians as well – it can be hard to ‘categorise’ your inspiration. And the whole subject can feel woolly or pretentious. Those of us with basically lower-class roots can still feel a little self-conscious about starting a sentence with ‘what inspires me is…’ or ‘the inspiration for my novel was….’ It’s not always easy to specify what your inspiration was anyway; sometimes it’s a subconscious thing, or the interaction of several influences that sparks something. Even then it can be a glowing ember, gradually catching the material around it alight, or an instant explosion of sparks – a real eureka moment. Sometimes we forget what our inspiration was – we just find a few notes we jotted down one day and perhaps we spin them, years later, into a coherent story thread or an idea for a piece of art. I don’t think there are many people, then, who could give one stock answer to the inspiration question. I’m sure that like me, most of them could name a whole host of things. Sometimes it’s music or a lyric; a film; a phrase in someone else’s story; overheard dialogue; a photo; the view fromthe car window; someone else’s experience or point of view; the label on my cardigan; my past, my future, history, a dog, a cat, a tree, my job, blah blah blah. Sometimes it’s even a Joke. For ‘Pop’, my story that’s due to be published in the 100 Stories For Queensland book, the inspiration was a situation-comedy-kind-of-joke – a scene with a speech bubble and caption on the front of a birthday card. The characters were there. The twist was there. Even a snippet of dialogue was there. It was just asking to be turned into a story! And this is often what it feels like. I wish I could remember who it was that described writing and rewriting as being like sculpting – the perfect work of art is inside the rough stone all the time, you just have to chisel the stone away patiently until you’re left with what you were looking for. Inspiration often feels the same to me. It’s there all the time. But sometimes we’re just not looking – or listening in the right direction. Yay! 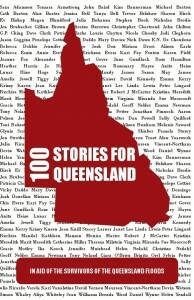 After some hold-ups due to the cyclone that followed Queensland’s flooding, this brilliant anthology to raise money for the Queensland relief effort is nearing publication. And this is what the front cover looks like! So get your wallets, purses, debit cards or credit cards ready for Tuesday 3rd May! Details of how you can grab yourself a copy will be coming to a blog post near you, soon. And I’m not just saying it’s brilliant because it contains one of my stories, ‘Pop’.